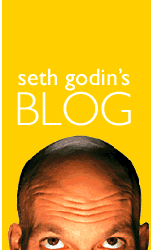 I love Seth Godin and look forward to reading his daily blog post each morning. In fact, it’s always one of the first emails I open each day. I’ve noticed, however, that in his blog posts, he will occasionally drop a seriously heavy word on his readers. I have found myself, numerous times, having to Google a word that he’s used because, quite frankly, it’s a word I’ve never heard of before! So today, for some strange reason, I’ve decided to start a new column called Seth Godin’s Word of the Day. I’m only hoping that each day, in his blog posts, he drops a heavy enough of a word to write about. So let’s get started with post #1 for Seth Godin’s Word of the Day. Sentence used (from Seth himself): We shouldn’t be so quick to excoriate those companies that launch interactive tools that fail. 1. Censure or criticize severely. 2. Damage or remove part of the surface of (the skin). Read Seth’s entire blog post today here.